Having enrolled in the Book Reviews Programme by Blogadda.com, this is the first time I have been selected to review a book. The book is titled "The Land of the Wilted Rose", by Anand Ranganathan. The cover, as you can see from the image on the left, has only an almost-dry rose on a yellow-ochre background. I felt very excited when I received the book... and when I opened it, I was in for more surprises. 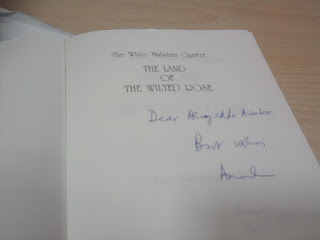 There was a handwritten note from the author (Anand Ranganathan) which added a personal touch. 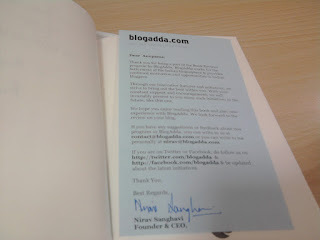 And a welcome note from the website, personally signed by Founder and CEO, made me feel very good. 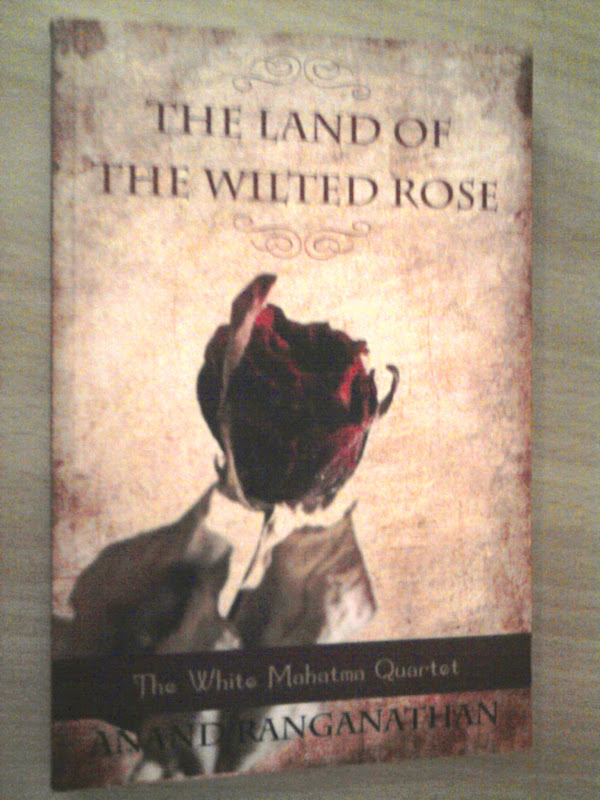 The Land of the Wilted Rose is the first of a quartet - a four book series. And whatever is written as a synopsis of the book on the back cover does not really tell you what the series of books, or this book in particular, is all about. Just a vague idea is all you will get. And the surprise element is right at the start. It gives you such a jolt that you are hooked on to the book right away. So long, in school and elsewhere, we have heard about how tyrannic the British were during their rule in India. The plot of the book is set at a time when the English have conceded ground, and Indians are gaining power. So much so that the tables are reversed completely: the Indians abuse the English and oppress them. A prominent character is the Maharaja, who is all but seventeen years old. Yet, he is the ruler of 73 provinces, as good as ruler of the World. So much power, wealth and luxury at this young age has indeed spoilt him to the core. What is more, the subjects and officers of this Indian maharaja are all English. The book excels in its detailing and tongue-in-cheek humour. The characterization is just mind blowing. The author has brought forward the finer traits of each human being, be it the king or the common man. This book, being a part of a series of books, only creates the prelude for the rise of the White Mahatma, who would eventually rise to fight for the right of Englishmen. But I felt that all four parts of the story should have been published together, in a big fat novel instead of part books. The reason is that one may lose track if he picks up a book that is intermediate in the series... and moreover, lot of text has to be devoted to refer to past incidents if separate volumes are used. You know what I mean? For example, the Harry Potter books also form a series... the characters grow and the plot thickens in each book, but even if you pick one up randomly, you would enjoy it as an independent novel. This was what I found missing in this book. The overview of the following books in this series has been provided to ensure that your eyes remain on your bookstore till you get hold of the final novel. This review is a part of the Book Review Programme at Blogadda.com. wow..welcome to reviews of blogadda!! as always you are crisp in your description!! may not pick this one up..but glad u reviewed it!! Sounds an interesting premise... Will try it. Thanks for sharing. Take it from me and try it! I would advice that you wait till all the four books are published. i would like to share here one thing. my friends and myself are great followers of Mahatma. we try to spread his views to people when we get free time. thanks for sharing Anupama. Thanks for visiting and commenting on Blogtrotter Two. Look forward to seeing you there often! Enjoy and have a great weekend!!! Read my review carefully. This book is like a photo negative of reality.. the Indians rule, and the English are oppressed. An Englishman shall rise to fight for rights of his race.. he is rhetorically called the "White Mahatma"... but this series may not be exactly about Mahatma Gandhi or his teachings. I'll do your tag shortly!! Thanks! Hope you enjoy reading my blog. I adore yours! Good review Anupama! 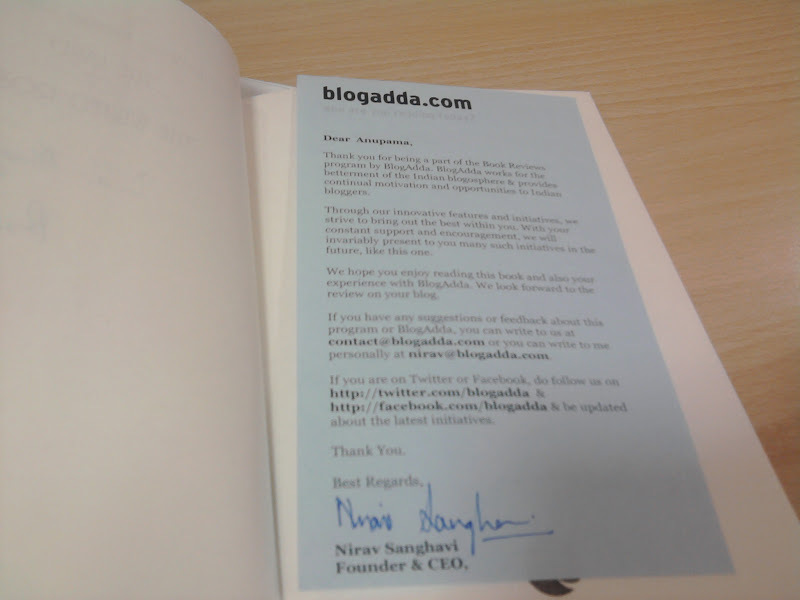 It is indeed nice to receive the book with a handwritten message :). u've done a good job..
First time here. Crisp & brief review. Looks like a must read except that one has to source all 4 books together. A bit of a pain that. I have experienced trouble while commenting on some blogs.. I think there is some change brought in on some platforms. Did you have problems commenting on mine? Welcome to this "Volatile" Space. No you would enjoy this book even if you read it isolated.. but then, it makes no point.. it seems like a prologue to something coming up. excelent,review and blog design and stting.